That challenge was directly presented for the first time in 1926, when four Presbyteries submitted an overture to the General Assembly of the United Free Church to initiate legislation declaring the eligibility of women for admission to the colleges of the church, who, on completion of the prescribed theological studies, might be licensed to preach, and ordained to the ministry on the same terms as men. 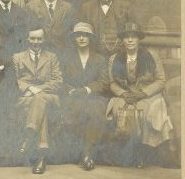 That year, Elizabeth G K Hewat, an outstanding scholar who also lectured at the Women’s Missionary College, became the first woman to graduate Bachelor of Divinity from New College. Proposing the motion, Prof James Young Simpson contended that ‘They had in New College a young woman who had beaten all the men in her class. It was extremely difficult to have to say to [her] “You have gone through your course in this admirable way, you are giving your life to service in the foreign field, yet we cannot put you on the same level as the men”’. Opponents contended that the Holy Ghost, having inspired Paul to enjoin male headship and female submission, “would not now go against his own productions.” And it was claimed that: “the admission of women to the ministry would discourage a certain class of men of virile type from entering the profession. Who would be head of the manse?…surely it would mean the introduction of a celibate order into the church.” The motion was withdrawn in favour of an amendment that the time was not opportune for taking any steps. Between then and 1968, a succession of commissions, committee and reports purported to deal with the place and ministry of women in the Church of Scotland. But the central matter of equal ministry was finally resolved between 1963 and 1968. 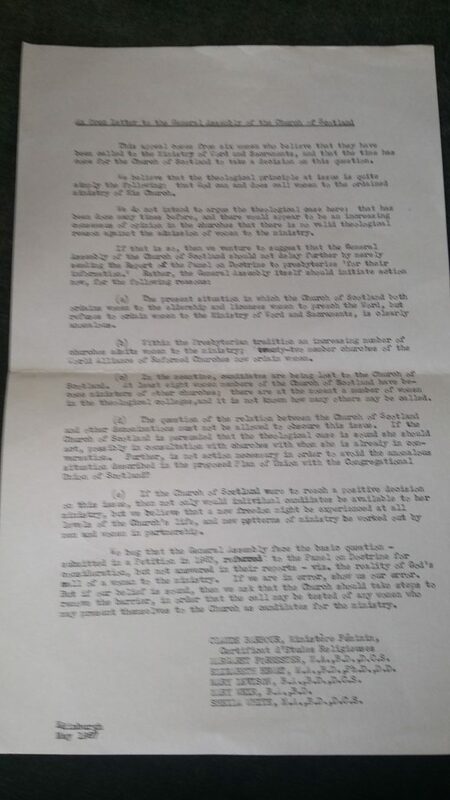 Galvanised into action when the Panel on Doctrine reported in 1962 that it did not expect to take up its remit to consider women in the ministry ‘for some time’, Mary Lusk MA BD decided to take action. She was a woman of outstanding intellect – a graduate of Oxford who studied divinity at New College in the early 1950s. She was a recognised leader who represented the Kirk at the World Council of Churches Assembly in 1954, a deaconess who had built up a new congregation in Musselburgh, but had to hand it over to on ordained man. In 1963 she was working as associate chaplain at Edinburgh University – a position for which the holder would normally expect to be ordained. Lusk petitioned the General Assembly to have her call to ministry tested and, if recognised, to proceed to her ordination. Certain of her vocation, and already licensed to preach the Word, she believed the onus was on the Church to say why she was not fit to exercise a Ministry of Sacrament. Her speech was measured, informed, impressive, and New College students in the gallery cheered Lusk and her supporters. The Moderator, Prof James S Stewart, twice had to threaten to clear the gallery if they didn’t keep quiet. Finally, one year later, the historic decision was made that women could be called as ministers on the same terms as men. 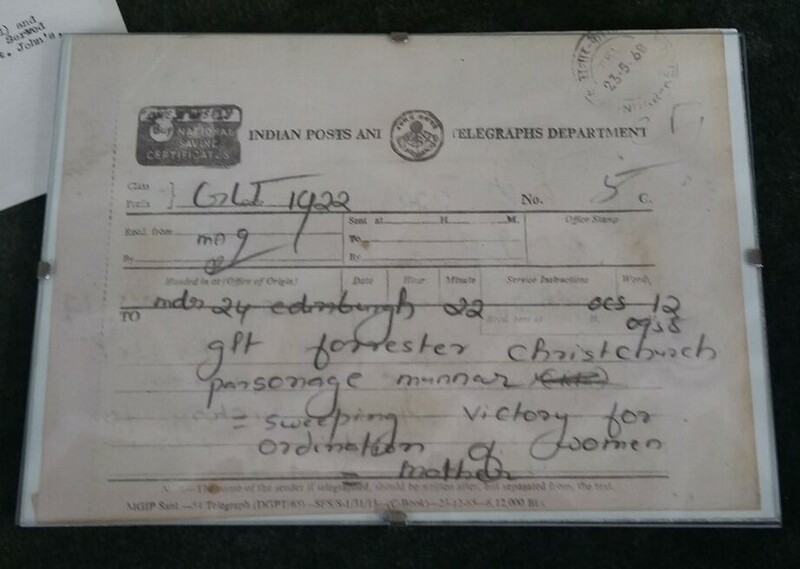 Isobel Forrester sent a cable to her son Duncan and his wife Margaret, working in India. It declared a ‘sweeping victory for women’s ordination’. This decision, after decades of debate and the faithful endeavours of women who believed they had the right to test their vocation to ministry, brought new opportunities and challenges. It has changed the face of the Kirk. After the vote, Mary Levison commented ‘the Church no longer regards women as second class citizens. I hope this decision will have a liberating effect right through the Church’. Today, around 30% of ordained ministers are women, serving in diverse contexts and situations. Mary Levison tells her own story in ‘Wrestling with the Church’, published 1991 and on display in New College Library, alongside her New College class photograph of 1953. 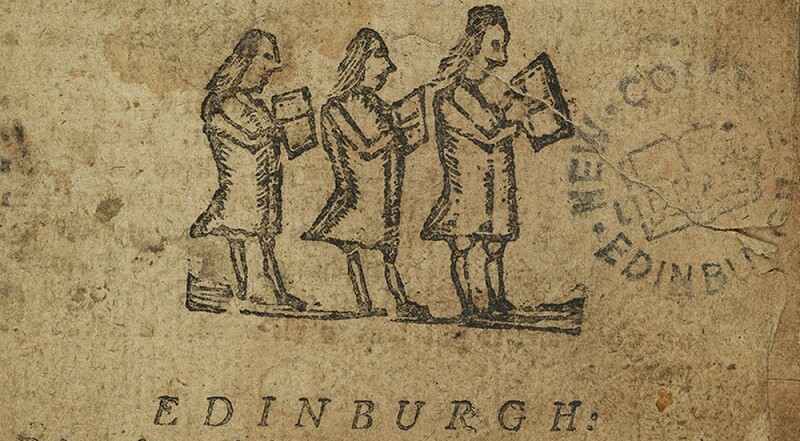 This entry was posted in Library, New College Library and tagged Church of Scotland, General Assembly, New College Edinburgh, women by cloverodgers. Bookmark the permalink.